충주시에 소재한 백운암은 1886년 무당의 신분으로 진령군이라는 작호를 받아 여자 대감이 된 윤씨에 의하여 창건된 사찰로 전해진다. 이 사찰에서 주존불로 봉안하고 있는 이 철불은 원래 이곳에서 전하던 불상은 아닌데, 인근에 고려시대 대규모 사지인 억정사지(億政寺址)가 있어서 아마도 이곳에서 옮겨온 것이 아닌가 추정되고 있다. 충주는 철의 산지로 백운암의 철조여래좌상 이외에도 대원사(大圓寺)의 충주철불좌상(보물 제 98호)과 단호사(丹湖寺)의 철불좌상(보물 제 512호)이 전하고 있어서, 이 세 구의 철불은 충주 지방의 3대 철불로 알려져 있다. 백운암의 철조여래좌상은 통일신라 8세기 석굴암 본존상 이래로 유행한 편단우견(偏袒右肩)의 항마촉지인(降魔觸地印) 여래 좌상으로, 규모는 높이 87㎝정도의 크지 않은 상이다. 얼굴은 몸 전체에 비해 작은 편이나 이목구비의 표현이 뚜렷하고 근엄한 표정이 잘 표현되어 있다. 목에는 삼도(三道)가 보이고 어깨가 넓으며 가슴이 융기되었고, 결가부좌(結跏趺坐)한 다리의 폭이 넓어서 당당한 자세를 보인다. 몸의 표현이 전체적으로 양감있게 조각되었고 대의 자락에서 부분적으로 번파식 옷주름을 볼 수 있어서 이 불상이 통일신라 8세기 양식을 반영하고 있는 상임을 알 수 있다. 그러나 양감이 8세기 불상만큼 풍부한 것은 아니며 항마촉지인의 수인(手印)도 전형적인 형식이 아니어서 8세기보다는 시대가 내려가는 것으로 보인다. 따라서 조성 시기는 통일신라 말에서 고려 초 정도로 추정된다. 이 철조여래좌상은 비교적 통일신라 불상 양식의 특징을 많이 간직하고 있어 충주 지역 철불 중에서는 가장 연대가 올라가는 상으로 추정된다. 또한 상호도 원만하며 전체적으로 크게 손상된 부분이 없고 조각 양식도 좋은 편으로, 통일신라시대 이래 철불 연구에 매우 중요한 상이다. Baegunam Hermitage in Chungju is said to have been founded in 1886 by a female shaman named Yun, who was given the title Lord of Jillyeong by the government of the Joseon Dynasty. 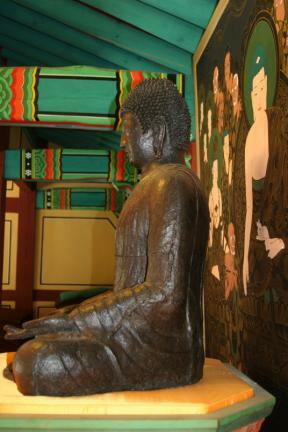 The principal statue of the hermitage, this Iron Seated Buddha is assumed to have been moved here from the nearby ruins of Eokjeongsa, a large temple of the Goryeo Dynasty (918-1392). 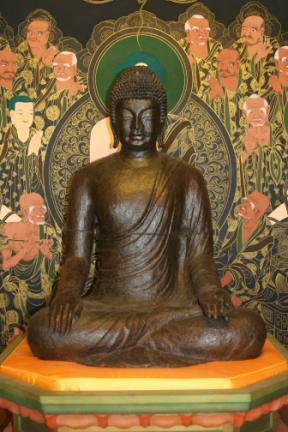 The Buddha has a gentle face. It is dressed in a robe draped over the left shoulder and seated cross-legged with a mudra touching the earth to call it to witness his awakening, a style reminiscent of the main Buddha in Seokguram Grotto that became popular after the eighth century in Unified Silla (676-935). With a height of 87cm, the image has a rather small but stern, clearly carved face and three creases around the neck. It has broad shoulders and a plump chest with the knees spread wide in a stable pose. The body is voluminous overall, though not so corpulent as most eighth-century images. But the large wavy folds on the robe are similar to those on eighth-century images. The mudra, however, is not the typical earth-touching gesture. Therefore, the image is assumed to have been carved between the late Unified Silla and early Goryeo Dynasty. 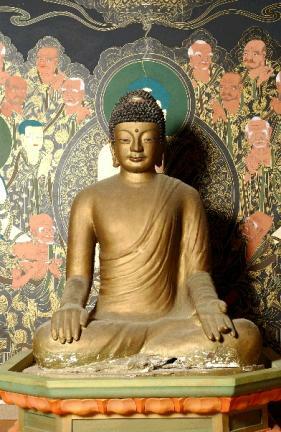 This is the oldest among three famous iron Buddhas handed down in the Chungju area, traditionally famous for rich iron production. The other two images are at Daewonsa and Danhosa Temples, and have been designated Treasure No. 98 and No. 512, respectively. The present statue shows a skillful carving style and no major damage.